Here's a great gift for the music lover on your list. 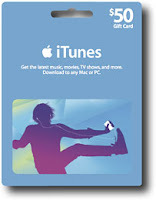 Get a $50 iTunes Gift Card for only $40 with free shipping from Best Buy. Choose from three different designs!